Amatrol’s Design of Structures 3 Learning System (94-DOS3) covers the basic principles of surveying, surveying equipment, reading and interpreting maps, and global positioning systems. Surveying involves taking measurements of land and its features and then processing this information into usable data. Surveying provides essential information used by construction professionals, civil engineers, and more! 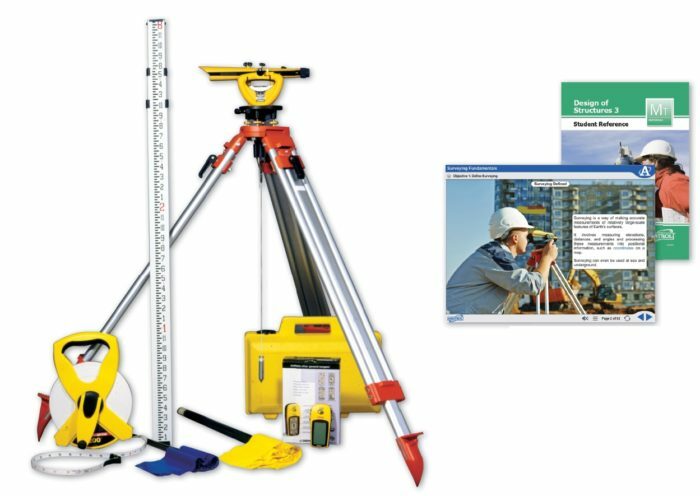 This surveying training system includes a level-transit kit, global positioning system, printed surveying curriculum, an instructor’s guide, an installation guide, and a student reference guide. This equipment and curriculum will be utilized to cover vital topics like level-transit operation, trigonometric survey applications, topographical maps, global positioning system applications, and more! The surveying training system includes a variety of real-world surveying equipment like a global positioning system (GPS), level transit, rod kit, tripod, and level-rod. Learners will use these components to practice skills like using a level-transit to run a straight line and measure differences in elevation, using a level-transit and level-rod to lay out horizontal and vertical angles, and using a GPS to perform and verify a survey. Related skills that learners will practice include using longitude and latitude coordinates to find a location, identifying symbols on a topographical map, and reading a plat. Surveying Training covers the basic surveying principles and equipment and how they are used to perform surveys and read maps, as well as global positioning system applications. More detailed examples of learning topics include: how to operate the level-transit; how to perform a boundary survey; how to obtain a plat; and how to use GPS to perform or verify surveys. This surveying training course includes Amatrol’s interactive multimedia format, which provides comprehensive surveying knowledge and enriches it with videos, interactive quizzes and exercises, 3D graphics, and voiceovers of text. A sample copy of the Design of Structures 3 Student Reference Guide is also included with the system for your evaluation. Sourced from the system’s curriculum, the Student Reference Guide takes the entire series’ technical content contained in the learning objectives and combines them into one perfectly-bound book. Student Reference Guides supplement this course by providing a condensed, inexpensive reference tool that learners will find invaluable once they finish their training making it the perfect course takeaway.